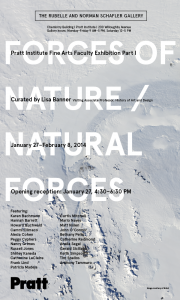 Forces of Nature opens tonight at Schafler Gallery on the Pratt campus in Brooklyn. It is the first of two exhibitions of Fine Arts Faculty. Easy Street will be included. There is much being commented on this week about Lena Dunham’s photo spread in the current issue of Vogue. Another site challenged anyone with access to supply the original Annie Leibovitz photos of the famously plain creator/writer of the HBO Series Girls. It shows the Before / After once digital manipulation is accomplished. Noteworthy are the very subtle body alterations and retouches, especially the light changes that make so much difference in the final product. PhotoShop has altered our perception of what The Real is. Photographers have been playing around and inventing from the time that photography was invented. The exhibitions at The Met, Faking It and before that Spirit Photography are recent examples of these extraordinary concoctions. In the Vogue case, it is done all the time in fashion media, and it is more about profit and the public relations of selling an image package than it is about the joy of the imagination. Re-creation and change is in the nature of man’s need. The obsessive change according to a media model of what looks good is a function of something else. The snapshot I include here of Beaver and Billy was taken yesterday and manipulated to give he appearance of a camera image on film. For those of us around these systems, we understand that there is always manipulation involved, whether by accident, by the state of the technology at the time or by intention. A photograph is no more about reality than a Rembrandt. 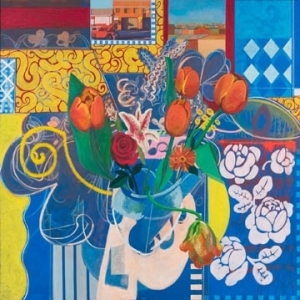 What the Artist does, however, is reach to some deeper truth so the manipulation reveals the Real rather than occludes it. 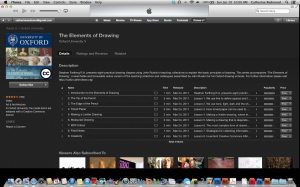 iTunes U has a number of on line courses. Administrators in academia are drooling over the prospect of distant learning in this way, more customers and lower faculty costs are too delicious a prospect to ignore. It is part of the New Stupid where technology has outpaced ways to use it and so technology has formed new eddies of activity because of itself rather than in the service of some other more pressing need. (Steve Jobs understood this implicitly) The dark side of technology’s power is that it negates labor and is more about bottom line-save-money-and-lower-labor-costs than it is about freeing people from laborious tasks. Learning from the screen is not well understood. It is not the simple broadcast of information. Something else happens in learning. It usually requires another human present in the flesh. Beats me what that transfer is or why it is, but it isn’t simply sending some text or audio over the internet to a recipient who will then take in the knowledge like a donut. Nonetheless, on line courses have interested me for a long time and I poke around looking at them from time to time to find what’s being offered, what’s popular and what readings are being assigned. 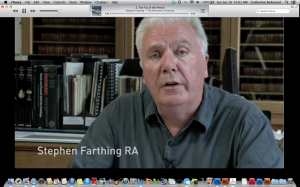 Yesterday on ITuneU I watched The Elements of Drawing (taken from Ruskin’s legendary book available from Dover) and was pleasantly surprised by how well the instructor, Stephen Farthing, used the medium. It’s very, very simply done and it seems a credible course for the beginner or one who wants to refresh his idea of drawing. The lessons were simple, direct and with methods that are easily learned. Oxford University has a group of courses on various topics and The Ruskin School of Art has these subsets. 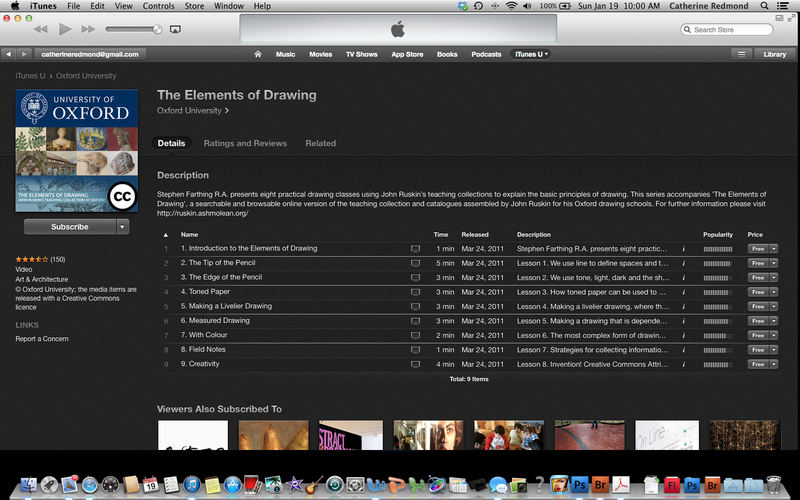 It’s free and for anyone interested, I recommend it as a good way to refresh you basic thoughts and practice about drawing from nature. The internet does simple very well. In the morass of critical language it’s refreshing to return to the simple. Radiant Hall in Pittsburgh, Pennsylvania, is included in the city’s local tv program. The feature moves from the International to the Local. The Local is always where creativity begins. Ryan Lammie, my former Thesis Student at Pratt, is featured in a sequence which begins at 21:35 toward the end of the program. Ryan has demonstrated what artists can do when they realize their creative power, find mutual purpose and work collectively. Cities outside the major art/money centers are benefitting from a redistribution of talent. Take notice. Easy Street, 2003, Oil on Canvas, 60″ x 60″ will be included in Natural Forces/Forces of Nature. 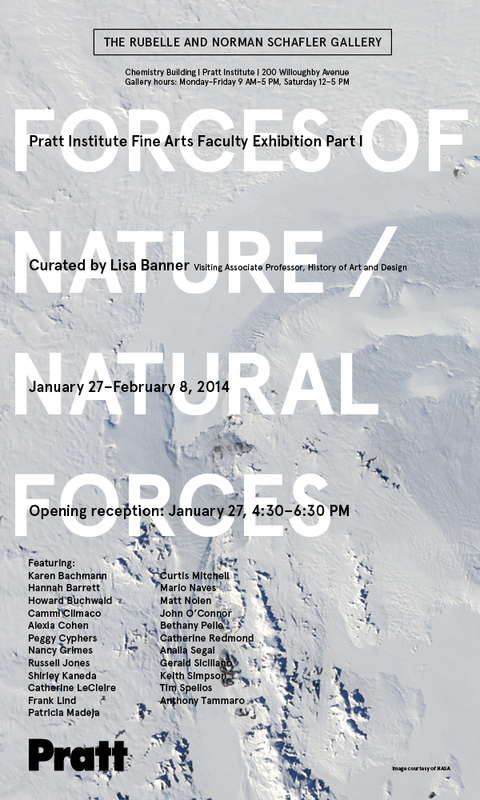 Natural Forces/Forces of Nature is the first of a two-part group exhibition of work by some of the Pratt Institute Fine Arts faculty. Curated by the scholar Lisa Banner, the show opens at the Rubelle & Norman Schafler Gallery on January 27, with a reception from 4:30 to 6:30 p.m. Through February 8, 2014. Even though we expected a crowd yesterday, an artist friend and I decided to see the Balthus Exhibition at The Met one more time before it closed. I was again surprised by his precocious drawing series on the loss of his cat, Mitsou. I had been stirred by its premature blossoming of a young artist’s gift, but yesterday my admiration developed to wonder. Since I’ve spent that last several months looking at a reprint of the book, examining these drawings again in the gallery, the force, the conceptual (neurological, I really mean) power, the comprehension and manipulation of visual space is so advanced, I started to wonder if some other artist had created them. How does a kid have that ability at that age? The visual sophistication of those drawings is singular. On my way home in a cab last night I started to wonder if Balthus had any childhood in the sense of a visual innocence. The reception is still fresh in my memory. Here are a couple of photos of its beginning.